Some things catch you off guard when you really stop and think about them. Consider, for instance, the fact that it’s taken Jay Farrar no less than 14 years to find himself party to a proper live album. Various and sundry reissue tracks and the Long Cut + Five Live promotional disc excepted, Uncle Tupelo never released a live album, and the now-on-seemingly-indefinite-hiatus Son Volt threatens to go off into that dark night without a frenzied audience barnburner to its name. For some who have seen (and tried hard to be moved by) Farrar onstage over the years, perhaps now’s the time to swallow our reverent silence and admit that there may be a reason for all this. Memory drifts back to more than one Son Volt show where the night’s primary excitement involved watching the cigarette dangling ravaged from bassist Jim Boquist’s lips and wondering where the ash would land while Farrar, forever glued in place, listlessly warbled lines to some indeterminate spot on the back wall. Expressionless and all but cruelly sober, Farrar onstage has long been the patron troubadour of the aloof mumble, all beauty and somber wisdom getting lost somewhere in the haze of vague boredom. So much more the refreshing then to hear this, an elegant odyssey through Farrar’s expanding solo repertoire in all its sincerity and vitality presented live with sensitivity and warmth. Credit goes to Canyon, who served as his backing band throughout the September and October 2003 tour from which these songs were culled. Embellishing the songs with skywide steel-guitar swells, carefully cascading drum work and glistening organ ripples, Joe Winkle, Brandon Butler and company supply Farrar with a full, rich and textured sonic tableau on which to lavish his musings. Farrar, for his part, responds with a supple, natural vocal delivery that sounds softer and better lived-in than it ever has. Chalk it up to a good recording perhaps, or maybe a determined comfort with the mission at hand. 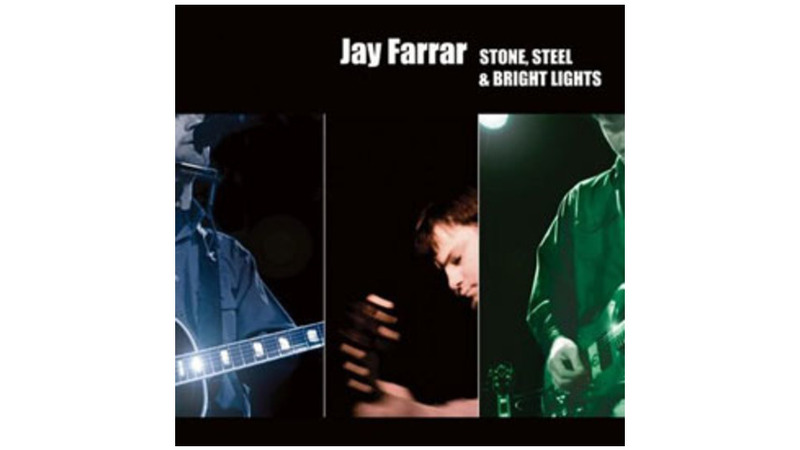 With 15 of its 19 tracks comprising a set list that roughly and evenly represents Terroir Blues and Sebastopol, Farrar’s clearly trying to flesh out his solo career, adding two new songs to the canon—sets opener “Doesn’t Have to Be This Way” and “6 String Belief.” For their part, “6 String Belief” is the stronger of the two, although vocally there are moments when Farrar seems to struggle to inflect properly over the spurring tempo he establishes with his chiming acoustic self-accompaniment. More self-assured is his closing cover of Neil Young’s “Like A Hurricane,” fed by a committed but sludgy rendering of Pink Floyd’s “Lucifer Sam,” which finds Farrar sounding oddly Stipe-like, peeking through the organ-and-guitar shadows of Syd Barrett’s psychedelic phantasms. Together the covers with their jammed-out abandon provide a nice capstone to a selection that admittedly hovers around mid-tempo. Warm and enveloping, Bright Lights finds Farrar at the top of his game—still not much stage patter, but plenty of heartland rhapsody to go around.